Submitral aneurysm of the left ventricle (LV) is very rare, although recognized abnormality resulting from many causes. Such lesions have previously been reported in the Black Africans. 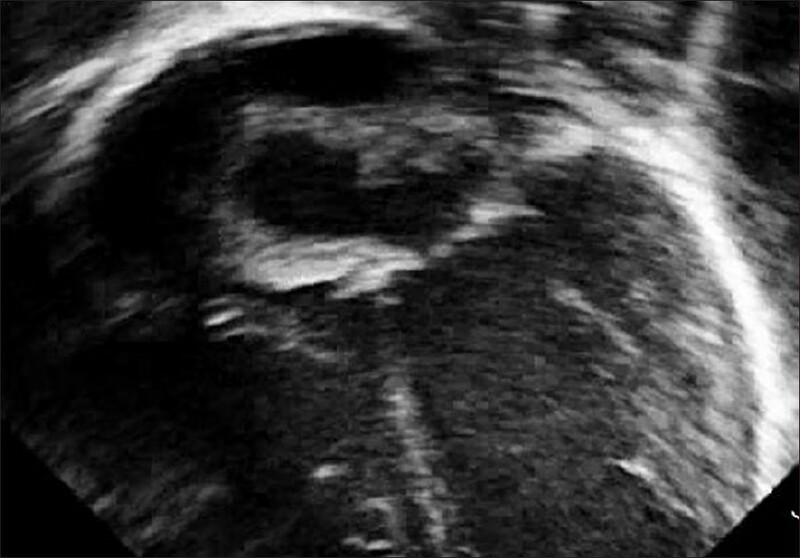 We report antenatal diagnosis of submitral aneurysm in a 26-week-old fetus in a primigravida mother. 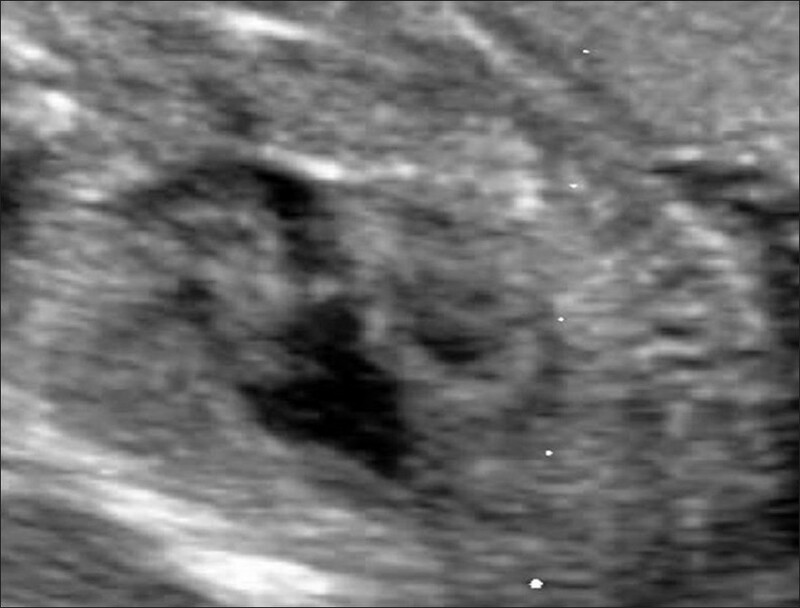 A 26-year-old primigravida with gestation of 26 weeks presented for fetal echocardiography with fetal tachycardia on antenatal ultrasound. 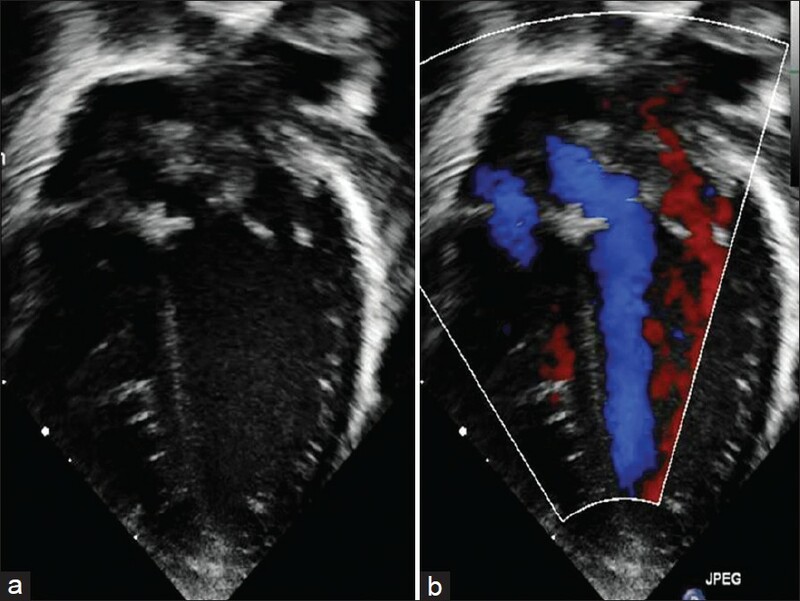 Fetal echocardiography showed large aneurysm arising from the submitral region, protruding predominantly into the right atrium (8 × 7 mm) and partly into the left atrium [Figure 1]a and b, [Video 1]. The aneurysm expanded with ventricular systole and decompressed with ventricular diastole. Considering this characteristic feature, the possibility of a submitral aneurysm was considered. The differential diagnosis of atrial septal aneurysm was considered, but as the aneurysm projected predominantly into the right atrium and expanded in systole, this diagnosis was excluded. There was no inflow obstruction with normal tricuspid and mitral valve inflow velocities. There was no mitral regurgitation. There was no other intracardiac abnormality [Figure 2]. The characteristic movement of the aneurysm, i.e., the expansion with ventricular systole and its collapse with ventricular diastole was seen. There was transient fetal tachycardia (heart rate of 210/min) with PR interval of 70 m sec and 1:1 atrioventricular (AV) conduction. During the rest of the study, the heart rates varied from 140 to 160/min with 1:1 AV conduction. Ventricular contractility was normal and there was no pericardial effusion. The baby was delivered at term through normal vaginal delivery. The birth weight was 3 kg. Postnatal evaluation confirmed the diagnosis of submitral aneurysm [Figure 3] and [Figure 4]a, b, [Video 2]. The child is asymptomatic after birth with sinus rhythm and is under close follow-up for the size of the aneurysm and any other hemodynamic compromise. The child is planned for an elective surgery. Submitral aneurysms are rare and were described for the first time by Abrahams et al., among the Black African population. ,,, This is a lesion of obscure origin with rare and varied causes. ,, Submitral aneurysms occur only underneath the posterior leaflet of the mitral valve and below the intermediate portion of the left aortic sinus. The anatomy of the lesion is quite complex and it extends mostly behind the left atrium, the left ventricle, or both. The aneurysm extended mostly below right atrium in our case. The basic pathology in these lesions has been described as a disjunction between the LV musculature and the left atrium-mitral valve region which ties up the left atrium, LV, and the mitral valve, ensuring electrical isolation. The extent of the involvement in the aneurysmal process can vary from a small area to the entire region of the posterior mitral annulus. Its size can vary from a few millimeters up to several centimeters. Based on this, DuToit et al., classified submitral aneurysm into three types: type I, single localized neck; type II, multiple necks (separate distinct openings); and type III, involvement of the entire mitral annulus. Our lesion represented type II aneurysm. Hemodynamically, submitral left ventricular aneurysm involves the fibrous mitral annulus, and with enlargement, displaces the posterior mitral annulus and subvalvular supporting apparatus apart, resulting in restriction of the posterior mitral leaflet and failure of leaflet coaptation with secondary mitral regurgitation. In our case, there was no mitral regurgitation. Antenatal diagnosis of submitral aneurysm is very rare with anecdotal case reports (3). Surgical intervention is the only method of treatment of submitral left ventricular aneurysms. , Our patient, being asymptomatic, was being followed up closely and awaits the repair of the submitral aneurysm. In conclusion,submitral aneurysm may be antenatally diagnosed. The implications of fetal diagnosis of submitral aneurysm requires further studies. It is important to recognize the antenatal diagnosis of submitral aneurysm. 1. Abrahams DG, Barton CJ, Cockshott WP, Edington GM, Weaver CJ. Annular Subvalvular left ventricular aneurysms. Q J Med 1962;31:345-60. 2. Skoularigis J, Sareli P. Submitral left ventricular aneurysm compressing the left, main coronary artery. Cathet Cardiovasc Diagn 1997;40:173-5. 3. Cavallé-Garrido T, Cloutier A, Harder J, Boutin C, Smallhorn JF. Evolution of fetal ventricular aneurysms and diverticula of the heart: An echocardiographic study. Am J Perinatol 1997;14:393-400. 4. Geukens R, Van de Werf F, Ector H, Stalpaert G, De Geest H. Ventricular tachycardia as a complication of annular subvalvular ventricular aneurysm in a Caucasian woman. Eur Heart J 1987;8:431-4. 5. Szarnicki RJ, De Level MR, Stark J. Calcified left ventricular aneurysm in a 6 year old Caucasian boy. Br Heart J 1981;45:464-6. 6. Rose AG, Folb J, Sinclair-Smith CC, Schneider JW. Idiopathic annular submitral aneurysm associated with Takayasu's aortitis. Arch Pathol Lab Med 1995;119:831-5. 7. Lintermans JP. Calcified subvalvular left ventricular aneurysm: An unusual case in a 4-year-old child. Pediatr Radiol 1976;4:193-6. 8. Esposito F, Renzulli A, Festa M, Cerasuolo F, Caruso A, Sarnicola P, et al. Submitral left ventricular aneurysm. Report of 2 surgical cases. Tex Heart Inst J 1996;23:51-3. 9. Nayak VM, Victor S. Sub-mitral membranous curtain: A potential anatomical basis for congenital sub-mitral aneurysms. Indian J Thorac Cardiovasc Surg 2006;22:205-11. 10. Du Toit HJ, Von Oppell UO, Hewitson J, Lawrenson J, Davies J. Left ventricular sub-valvar mitral aneurysms. Interact Cardiovasc Thorac Surg 2003;2:547-51.